Level 3 puzzles are designed to be solved starting from a row or column at the top of the puzzle with 2 clues. First, find the common factor of those two clues that will allow you to write only numbers from 1 to 10 in the first column of the puzzle. 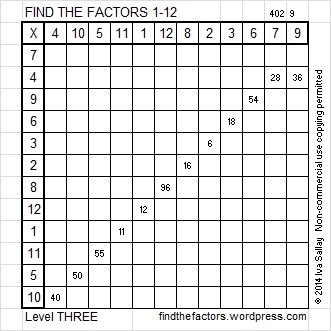 Then factor row by row to the bottom of the puzzle making sure each number from 1 to 10 is written only once in both the factor row and the factor column. You will notice a rhythm for the answers as you work. Since level 3 puzzles are designed to be solved from the top of the puzzle to the bottom, they are fairly easy to solve. I will not usually write step by step instructions for them, but I will today. Last week’s puzzle was solved by beginning with the clues 28 and 36 because they are both in the same row. Their common factors are 1, 2, and 4. Choose 4 because it is the only common factor that will allow us to write only numbers 10 or less in the factor row. Below is a chart showing the steps IN ORDER that were used to solve this puzzle using logic. 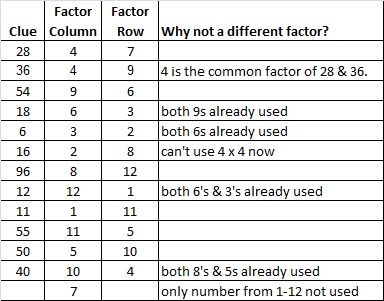 The chart states what to write in the factor column and the factor row for each clue. To find other 4 x 4 magic squares, try this method. 34 is a composite number. 34 = 1 x 34 or 2 x 17. Factors of 34: 1, 2, 17, 34. Prime factorization: 34 = 2 x 17. 34 is never a clue in the FIND THE FACTORS puzzles.